Is redundancy hurting your employee productivity? Are you looking for a custom software solution? ProductiveAdvantage is a simple and powerful document automation solution that boosts office productivity by making it easy to automate the creation of common documents. The easy to use Microsoft Word addin makes creating a template a snap, allowing you to mine the true value of document automation and create a large template base. ProductiveAdvantage has a unique approach to document automation that saves you more time and makes you even more productive: any document build with ProductiveAdvantage can be customized for a client and automatically becomes a template ready to be reused in another project. ePresenter 2.0 is easier to user than ever before. With the eligent new user interface and fulltext search ePresenter is a significant improvement over the first version. ePresenter is a software for Russian and Ukranian churches that makes it easy to display Bible verses, hymns, songs, anouncements, videos, and PowerPoint presentations. Custom website design starting from $400 for a five page website. Fully XHTML and CSS compliant. Get better search engine visibility. Optimize for search engine position. 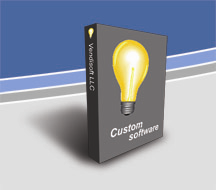 Custom software: Do you have an idea that will revolutionize your business? Vendisoft can make it happen! Feel free to contact us with any software projects.